Each monitor rotates 145° (+/- 72.5°) and tilts 22°. Supports monitors each weighing up to 20 pounds. SteadyArm can support monitors that range in size from the smallest available to those measuring 18¾" W x 16½" H.
Available with C-clamp or grommet. Integral cable management neatly stores cables. VESA monitor mount for 75mm and 100mm standard. 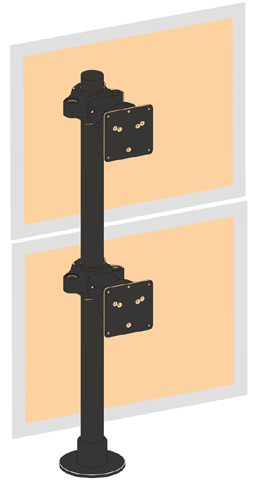 Secure mounting solution for 2 flat panel monitors stacked vertically.